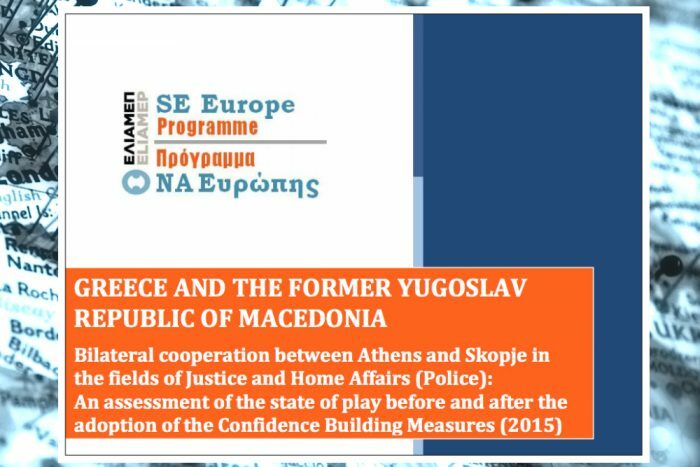 The South-East Europe Programme of ELIAMEP conducted in the course of 2018 a research which examines the progress of the implementation of the Confidence Building Measures between Greece and the Former Yugoslav Republic of Macedonia which were signed in 2015. This research is the follow-up to a research project that was conducted in 2017 and led to the publication of a report on the issue of cross-border cooperation between Greece and the Former Yugoslav Republic of Macedonia as well as the cooperation between the two countries in the area of higher education. The 2018 research focused on the implementation of the Confidence Building Measures regarding Justice and Home Affairs (Police). The research was funded by the Swedish Ministry for Foreign Affairs. The Analytica research institute, based in Skopje, conducted a similar research that examines the issue from the perspective of the Former Yugoslav Republic of Macedonia.